Conference attendees, from left, include: Juliane Zapalac, May Mour, Selina Santos, Sonya Turner, John Deveau, Sarah Pilgrim, Beverly le Roux and faculty adviser Patricia Williams. The SHSU Alpha Chi Texas Omicron chapter was recognized for its shining year at the organization’s national convention in St. Louis April 7-9. “The Star Award is given for those chapters that have done an outstanding job, and have participated in different activities throughout the year,” said faculty adviser Patricia Williams. Thirty-seven Star Awards were given at the convention, but Sam Houston was one of only six schools to have received it every year since the program began in 1996, Williams said. “ (Being one of six to receive it every year says) We are a very strong chapter, and that our students have done an excellent job of involving the members and holding campus activities,” she said. Individual members were also recognized for their contributions to the group. Senior and Alpha Chi president-elect John Deveau was selected as the recipient of the Region II Gaston Scholarship, a $1,000 prize, as well as being named the third alternate for the national Nolle Scholarship. In addition, Williams, who was elected to the national council and was given the Region II 2005 Distinguished Service Award as a sponsor, was honored by the organization by having a scholarship named for her. The Dr. Patricia Williams Education Scholarship will be given through Alpha Chi during the biennial national convention to the student whose presentation or paper is deemed best in the education category, Williams said. “ I was just very honored and thrilled that they would do something such as this, because we can now recognize an outstanding education student,” said Williams, who added that she was given the honor of presenting the scholarship to its first recipient, from Hawaii, this year. Also at this year’s convention, seven students gave presentations in their respective fields, including Deveau, who presented a business paper entitled "Intellectual Property Rights in the Doha Round;" Beverly E. le Roux, who presented the creative writing papers “Guinivere," "Numb Perfection," and " The Looking Glass;" May Mour, with music pieces "Searching" and "The Covenant Under the Rainbow;" Sarah Pilgrim and Selina Santos, with the dance "I Get By;" and Sonya Turner and Juliane Zapalac, with the poster presentation "Enzyme Activity and Specific Activity of alpha-Amylase in Human Saliva and in a Purified Sample from Bacillus licheniformis." In addition, the chapter officers nominated Teresa Ringo, one of the chapter sponsors and the SHSU registrar, for honorary membership, and the national council approved her nomination during the convention. 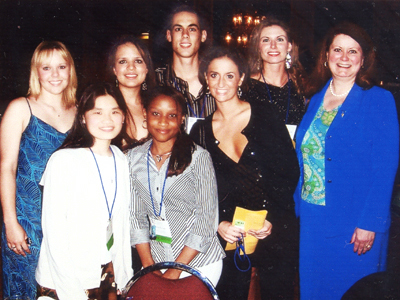 The 2004-2005 officers include Pilgrim, president; Deveau, vice president; Anela Leon Gurrero, secretary; Julieane Zapalac, treasurer; and Turner, historian.